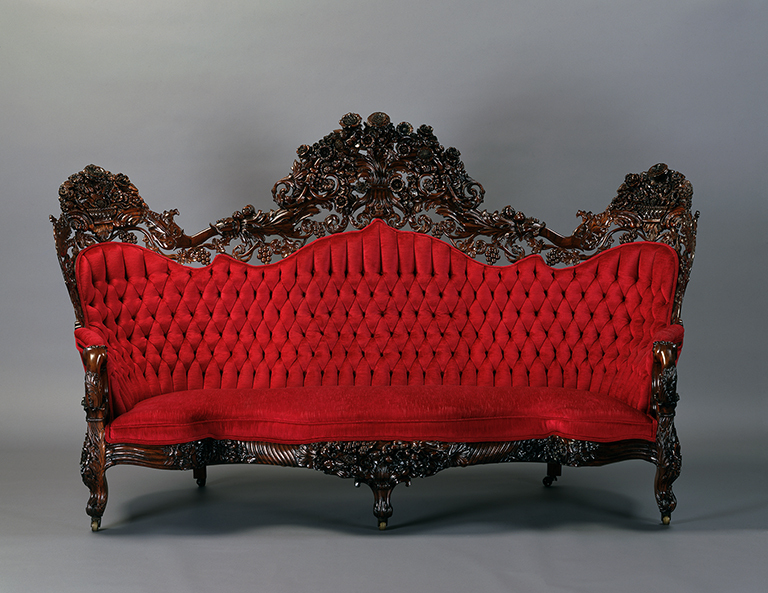 Through the latter half of the nineteenth century, John Henry Belter's sofas, such as the example here, could be found in the grandest homes and hotels. Sensuous and luxurious, his style mixed naturalistic flowers and foliage with controlled symmetry, muscular proportions, and whimsical exuberance. By the mid 1800s, Belter had established one of New York’s most fashionable furniture studios. His shop of over forty, largely German immigrant craftsmen, utilized innovative methods of bending and laminating wood to supplement their highly skilled handwork. They were able to create massive curving forms that were strong and lavishly carved but also lightweight. Buchanan, Mel. From the Collection--John Henry Belter Sofa. Milwaukee Art Museum: Under the Wings, February 10, 2012. http://blog.mam.org/2012/02/10/from-the-collection-henry-belter-sofa/. Milwaukee Art Museum News, July 2007, no page number, color illus. Andera, Margaret, Nonie Gadsden, Britt Salvesen, and Laurie Winters. Collection Guide: Milwaukee Art Museum. Milwaukee, Wisconsin: Milwaukee Art Museum, 2004, pp. 32 and 69–70, cat. 48, color illus. p. 32. Milwaukee Art Museum. Building a Masterpiece: Milwaukee Art Museum. New York: Hudson Hill Press, 2001, p. 108, color illus. Voorsanger, Catherine Hoover, and John K. Howat, ed. Art and the Empire City, New York, 1825–1861. New Haven, Connecticut: Metropolitan Museum of Art and Yale University Press, 2000, cat. 245, color illus. p. 245. Howe, Katherine S. et all. Herter Brothers: Furiture and Interiors for a gilded Age. Museum of Fine Arts, Houston and Harry N. Abrams, 1994, b/w illus. p. 64, fig. 42. Pettigrew Auction Company. Victoriana of the Rockies, Sunday, August 30, 1987 [auction catalogue]. Colorado Springs, Colorado: Pettigrew Auction Company, 1987, cover, lot 98..
Howe, Kathering S. Herter Brothers Furniture and Interiors for a Gilded Age. New York: Harry N. Abrams, Inc. 1994, p.64. Milwaukee Art Museum. Milwaukee Art Museum 1987 Annual Report, p. 11, 25. "Art and the Empire City: New York, 1825-1861," Metropolitain Museum of Art, New York, September 11, 2000-January 7, 2001.